The quilt is taking longer than we had thought it might. Too many other things going on. Last week was our Rendezvous Book Sale so it meant part of Friday was dedicated to setting that up. Today we quilted like mad but there was a Board of History meeting and then visitors. Two of our faster quilters were gone for the day. Finally as 3:00pm approached, the decision was made to add extra quilting time. We really want to get this quilt done before we stop for the summer. And soon we need to prepare the old school house for the Rummage Sale, and then a visit from school children and then…well, it gets turned back into part of the museum for the summer. All of the quilting supplies need to be tucked away until the fall. So this Wednesday some of the ladies will meet (and Lynda will order pizza) to make a concerted effort to get the quilt finished in the next two weeks. Their resolve pushed me to make another blog entry. It isn’t as though there aren’t enough things to write about – these women are amazing. And I often have extra photos. Its more just getting my thoughts clear about what to share. Should I tell how Gayle gently showed Bonnie how an iPad worked? Bonnie, who is in her 80s, has never used a computer before. She is thinking of moving to Idaho to be closer to her children. We are trying to persuade her to stay in touch with us using emails and emphasized that we could easily send her pictures of our group working diligently on Fridays. Or should I tell about how shocked we were to hear that someone had stolen firewood from the wood bank that the Episcopal church runs? A sense of disbelief – why would someone do this especially in a town like ours? 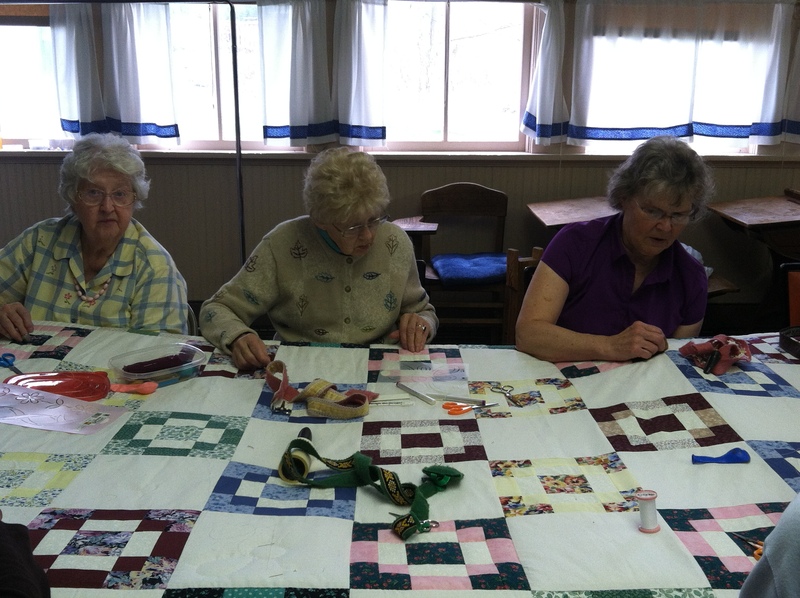 I will miss the Fridays quilting when we stop for the three summer months. This day seems to give a sense of peacefulness, a momentary calm in the week. I sit there listening to the women, or stitch away in the silence and feel that all is right with the world. We have our worries, our aches and pains, our sorrows but sitting together around the quilting frame, we are in balance, part of Csíkszentmihályi’s flow.